God cares more for these children than we can conceive. He wants them to be protected. Yet, He has been evicted from public property by the powers that be. He is told to stay out and then He is blamed when bad things happen. You can’t have it both ways. Never underestimate the power of feeling loved and accepted. Most people that commit horrendous crimes are deeply troubled. Often, this trouble begins with a lack of support and nurture. They feel separate from society and unaccepted by the ones they torment. The love of God transforms. The knowledge that God loves you changes your view of yourself. The understanding that God loves others changes your perspective on them. God’s love teaches us to love our neighbors and our enemies, not shoot them. We would inform children they are a special creation of God, but you insist on teaching them they are animals who are the result of cosmic accidents. The evolutionary view taught in schools is dangerous. History is replete with evils perpetrated by true believers in evolution. Until the late 1900’s, creationism was taught in nearly every school in America. With the rise of popularity evolution, some states banned the teaching of it from public schools in the early 1900’s. The Scopes Trial of 1925 was a turning point in the discussion. Although more states outlawed the teaching of evolution following the Scopes Trial, the Supreme Court ruled in 1968 that teaching creationism without teaching evolution violated the Establishment Clause of the Constitution. Enemies of God have used that flawed decision to practically outlaw the teaching of creationism on any level in US school systems. Evolution is more than a scientific theory. It is a philosophical system of life and a religious system of belief. It affects an adherent’s entire worldview. The result is that children are taught that they are merely a highly evolved animal. Not much different than any beast of the wild but for the ability to reason. Human life becomes cheap. There is nothing in life bigger than them. There is nothing after death. They are unwilling participants in an unfeeling and meaningless universe. Salvation not only changes your eternal destiny but also changes your heart. Learn how to be forgiven Here! We would teach children godly morality that would change how they see the world and treat their neighbor, but you insist that morality is conditional, ethics are situational, and the Bible is judgmental. The knowledge of a holy God Who has told us what is right and wrong is invaluable. The awareness of inevitable personal judgment from this Almighty God is powerful. The Bible gives us foundational expectations for mankind in the 10 Commandments. By removing God from the equation, they have unanchored society from the natural moral laws that provide security and peace. Today, children are taught that they are the result of cosmic mutations and accidents. Life has no meaning outside of pleasure and power. The godless mantra of “Eat, drink and be happy for tomorrow we die,” is the norm. It doesn’t have to be this way! Change is available. God is ready to help. Even now He desires to bring the children under His wings of protection and provision if you will allow Him. There is no argument for clear-minded people. Our culture and country have devolved morally since removing God from the public consciousness. There have always been guns available in the US. Only in recent decades do we discuss the need to remove guns or add police and metal detectors to schools. Great job to those of you who wanted God removed from society. 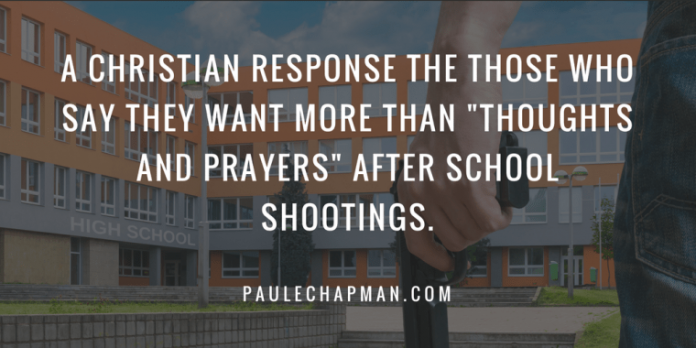 You have succeeded in making schools a “God-free zone.” Tragedy, pain, and unrest is your reward. You can continue your feeble efforts to legislate peace and happiness while ridiculing those who are ready, willing, and able to help. Or you could get out of our way and let us offer the peace and fulfillment that only Jesus Christ can bring.